In the other composition, Calvary, we meet Christ himself, during the last few hours of his life. He is sentenced to death, is forced to carry his cross on the thorny way to Golgotha. He collapses three times, he meets his mother, Simon helps him to carry the cross, Veronica offers him the vestment, they reach Mount Calvary, he is crucified and dies on the cross. They take him down from the cross and is put in the tomb. Ostrčil studied with Fibich, and was naturally influenced by him, insofar as his tonal language is more oriented towards Western Europe than the Slavonic-coloured music of his compatriots Smetana and Dvorak. But there are also influences from Mahler, Strauss and Schönberg and in Jack’s Kingdom one can also trace Shostakovich, not least in some burlesque and ironic march music. Purely orchestral music is found quite often as a bridge between the various scenes. 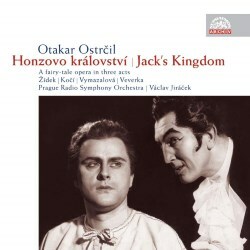 A lot is really powerful, there is some triumphant processional music and when Ondrej and Ivan, Honza’s evil and self-satisfied brothers, make their entrance at the end of act II, the accompanying music is pompous and overblown. But there is also beautiful and soft music and when Honza has accepted to become King a solo cello consolidates his decision. Ostrčil doesn’t fight shy of dissonances, often applied with a great deal of acidity. There are no self-contained numbers, so the music flows continuously in a very free and flexible recitative. The people – the chorus – have a lot to do, whether as soldiers (a merry soldiers’ chorus is heard at the end of the first act) or villagers (the opening of the second act). The cast is extensive, there are more soloists than indicated in the header, some are pure speaking parts. Satan opens the proceedings on arrival from the depths, speaking in a megaphone. When he disposes of the megaphone and sings he turns out to be an excellent dramatic-expressive bass-baritone, Přemysl Kočí. The old King, is sung by the sonorous bass Jaroslav Veverka, whose nobility of tone is very well suited to this humane character. His daughter, the Princess, is beautifully sung and acted by the bright soprano Jaroslava Vymazalová, at the time not yet thirty. Even younger was Ivo Zidek in the role of Honza/Jack. He is by far the best known of the singers, having appeared during his heydays regularly in Berlin and Vienna and as guest in many other European opera houses. He also took part in a great number of complete opera recordings for Supraphon. Here early in his career he is a very lyrical singer, expressive and with delicately nuanced readings of this complex role. All four sang together in a production premiered on 12 November 1952, a little more than a year before this recording was made. All the singing is not on this level, but with an all-Czech cast one can rest assured that this is the authentic thing. The mono recording has been digitally remastered for this issue and the sound is surprisingly good for its age. Even better is the sound on the companion piece, recorded almost four years later. The influence of Mahler is felt also here, but, as in the opera, Ostrčil has a voice of his own. The work is a set of fourteen variations for large orchestra and it opens powerfully but solemnly. The funeral march that accompanies the beginning of his wandering with the heavy cross is strongly dissonant. The meeting with his mother is inward and lyrical and grows in intensity. When Simon helps him carrying the cross the music becomes lighter and moves faster and more vigorously. The encounter with Veronica is expressed in a soft adagio played with considerable warmth. When he in the seventh variation collapses the second time there is wild panic in his inner man, while his appeal “Do not lament me” is mild and forgiving – but the feelings grow to a powerful climax. The ninth variation depicts his third collapse and is a rhythmically aggressive allegro. The arrival at Golgotha and the crucifixion are darkness – darkness that expands in crescendos. Then he dies in the twelfth variation, and after a lento opening the tumultuous agitato is like cries of anguish. There follow two slow movements. Variation XIII is a lamentation and the interment is a moving largo. The whole composition is utterly moving, and though the recording hasn’t got the refinement of sound one would have ideally wished, it is a valuable document excellently played by the Czech Philharmonic Orchestra under the distinguished Václav Neumann (1920 – 1995). These two works make an ideal coupling and the peace message of Jack’s Kingdom should have something to say to all peoples at a time when spite and hatred seems to be the norm of the day.